Goodwell, Okla.-The Panhandle State women’s basketball team gathered another road win over the weekend, claiming an 81-60 victory over Central Christian College, while the men’s team took a 13-point loss (103-90) to the Tigers. Head Women’s Basketball Coach Victor Esparza reflected on Saturday’s showcase stating, “Again we got off to a slow start, but once we got going we played really well.” The Aggie women found themselves trailing 21-12 after the first period of play, averaging just 22 percent in shooting and going 0-8 in three-point shots. Esparza added, “This was a total team effort. We had girls step up and have a big time plays that don’t show on the stat sheet.” For the game, the Aggies added 29 points off the efforts of non-starters. Rodriguez led the bench in scoring with 16 points along with Kim Best who brought in eight points for the Aggies; Rodriguez also contributed at the boards with six rebounds on the day. Baris Ulker helped the Aggie men gain an early advantage over the Tigers (9-6) with a game-opening three, along with senior guard Breiman Alexander, who landed back-to-back shots from beyond the arc in his debut back from injury. That would be the last lead the Aggies would own, as Central Christian pulled ahead 46-41 at halftime and outscored their opponents 57-49 after the break. The Tigers totaled 26 points off Aggie turnovers and posted 62 points in the paint. Panhandle State produced at 48.4 percent from the field and missed just one free-throw attempt, going 16-of-17 at the line. One major disparity between the two teams showed in bench points, as the Aggies were outscored 29-5 off the performance of non-starters. Alexander led the game in scoring with 30 points, putting up 18 points from three-point territory for a game-high of six shots landed beyond the arc. Ulker was the team’s second-leading scorer with 23 points, and tied for a game-high in rebounds with ten to notch his fifth double-double of the season. Alexander and sophomore DK Sumo brought down six boards apiece, followed by Brandon Green who tallied five rebounds off the bench. Sumo led the team in assists with six. The Aggie men now hold a 6-4 record on the season and sit 1-3 in Sooner Athletic Conference play. Both teams will take a break from the court for the holidays and each will return to the road for exhibition matchups on Dec. 29. The men’s team meets with Rogers State at 2 p.m. in Claremore, Okla. and the Aggie women take on North Texas in Denton at 3 p.m. Fans can follow along with live stats and video streaming of both games online at opsuaggies.com. Panhandle State basketball is back home in Anchor D Arena for an SAC double-header against Texas Wesleyan on Thursday, Jan. 3 starting at 4 p.m. with the women and following with the men’s game at 6. Goodwell, Okla.-The NAIA released the 2018 Daktronics NAIA Football Scholar-Athletes on Friday, with two Aggies making the grade. Offensive lineman Samuel Lemin and defensive lineman Sequoia Smith were among the 18 players listed from the Sooner Athletic Conference. Arizona Christian topped the charts with eight athletes making the roster; Lyon College and Texas Wesleyan each had three players, OPSU two and SAGU and Wayland Baptist had one apiece. Lemin, a senior from Canberra, Australia finished his fourth year as a member of the Aggies’ offensive unit and will graduate from Panhandle State with a degree in Accounting/Finance. He is an active member of the Phi Beta Lambda business club and was inducted in the 2018 class of the Chi Alpha Sigma National Athletic Honor Society. 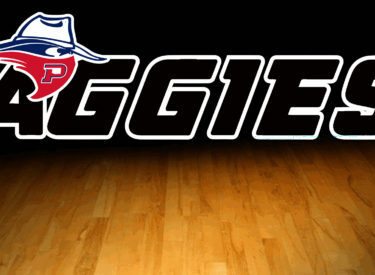 As a key member of the Aggie defense, Smith came to Panhandle State from Boyd, Texas and played in 32 career games. Also a member of Chi Alpha Sigma, Smith will graduate early with a degree in Agribusiness and Animal Science. To be eligible athletes must have achieved at least a 3.5 cumulative grade point average and must have attended two full years at the institution. A complete listing of this year’s honorees is available online at naia.org.